“Although we span many disciplines and professions,” says ASCO President Daniel F. Hayes, MD, FACP, FASCO, “we are a single community with a singular focus: to provide better care for patients at risk for or with cancer.” That is why the theme of this year’s American Society of Clinical Oncology (ASCO) Annual Meeting is Making a Difference in Cancer Care WITH YOU. Watch a patient education video with Dr. Hayes explaining why the ASCO Annual Meeting is so significant. A study of 491 testicular cancer survivors showed that 38% of them had a low testosterone level, known as hypogonadism. In addition, these survivors were more likely to have chronic health problems, including high cholesterol, high blood pressure, erectile dysfunction, diabetes, and anxiety or depression, compared with survivors with a normal testosterone level. Some men may have a low testosterone level when they are diagnosed with testicular cancer. Other men may develop a low testosterone level as a side effect of surgery or chemotherapy. This study analyzed data from a larger, ongoing study called the Platinum Study on the lifelong health of men who received cisplatin (Platinol) as chemotherapy for testicular cancer before the age 55. Researchers collect health information through questionnaires and basic medical tests. Factors that were associated with a higher chance of having low testosterone included being older and being overweight or obese. What does this mean? 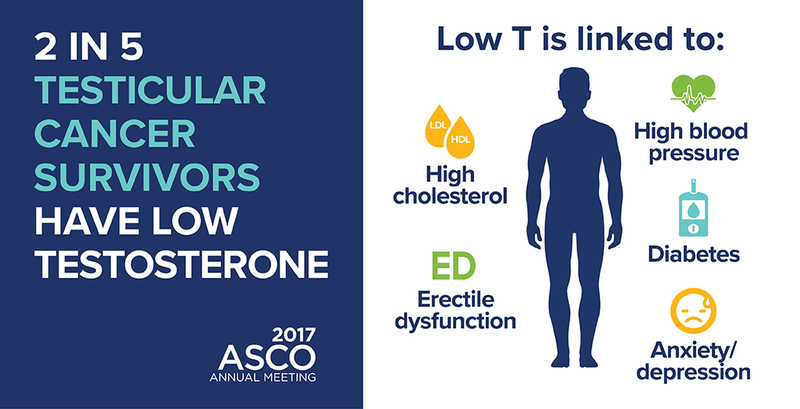 This study highlights the connection between low testosterone and other health problems in testicular cancer survivors. Researchers found that an 8-week web-based stress management program lowers distress and improves quality of life for people newly diagnosed with cancer. This program, called STREAM, was developed by oncologists and psychologists. It is a newer approach to therapy known as “therapist-guided online intervention” that appears to be as effective as traditional face-to-face therapy. The STREAM program covers 8 topics (1 per week), including the body’s reaction to stress, cognitive stress reduction, feelings, and social interactions. For each topic, patients received written and audio information and completed practical exercises and questionnaires at a time and place of their choosing. Psychologists went into the system weekly to review their progress and give them written guidance and support. The 129 people who participated in this study were divided into 2 groups, getting either support through STREAM or no psychological support. Most participants were women with early-stage breast cancer. There were also people with lung cancer, ovarian cancer, lymphoma, melanoma, and gastrointestinal cancers. The patients joined the study within 12 weeks after having their first cancer treatment. Before and after the study, researchers measured quality of life, distress, and anxiety and depression. They found that the patients’ quality of life improved and distress decreased. Distress was measured on a scale of 0 to 10. A score of 0 to 4 is considered “low distress.” A score of 5 to 10 is considered “high distress.” At the end of the study, the median distress score of patients who participated in STREAM decreased by 2 points, from 6 to 4. The median distress score for patients not participating in STREAM stayed the same at 6. The median is the midpoint, which means that half of all patients had a higher score and half had a lower score. The measures for anxiety and depression were similar for both groups of patients. After 2 months, the patients who did not initially receive STREAM started using it. Researchers will report on how introducing STREAM later compares to starting it earlier during the ASCO Annual Meeting. What does this mean? Online tools such as STREAM provide new ways for patients and their health care team to communicate effectively without being face to face. This approach can offer more patients access to psychological support, an important part of high-quality cancer care. A recent study showed that a new face-to-face psychological therapy program lowered cancer survivors’ fear of having the cancer come back, called a recurrence. Fear of recurrence is common among people who have completed cancer treatment. Severe fear can negatively affect survivors’ follow-up medical care, mood, relationships, work, goal setting, and quality of life. In this study, half of the 222 survivors participated in Conquer Fear while the other half received relaxation training. The relaxation training sessions were held for 60 minutes for the same number of days as Conquer Fear. Most of the participants in the study were young women diagnosed with breast cancer. There were also people diagnosed with colorectal cancer and melanoma. All participants had been treated for stage I to stage III cancer before the study and had no signs of cancer during the study. To measure fear of recurrence, researchers asked participants to fill out a questionnaire when they joined the study, immediately after participating in the Conquer Fear program or relaxation sessions, and then again 3 and 6 months later. The questionnaire, called Fear of Cancer Recurrence Inventory, provides a score from 0 to 168. Higher scores indicate a worse fear of recurrence. Researchers found that participating in Conquer Fear had a greater positive effect than the relaxation training on reducing the fear of recurrence. Fear lessened by an average of 18 points in the Conquer Fear group and by an average of about 8 points in the relaxation group in the scores taken right after participating. After 6 months, fear lessened by an average of about 27 points in the Conquer Fear group and by an average of about 18 points in the relaxation group. What does this mean? Counseling that addresses the fear of recurrence could play an important role in enhancing people’s psychological and emotional well-being following cancer treatment. This could expand opportunities for survivors to receive quality post-treatment care. New research has found that people with advanced cancer who received specific in-person counseling sessions had fewer symptoms of depression and improved psychological well-being than those who received the usual care. Usual care consisted of screening for distress and basic psychosocial care. Advanced cancer triggers enormous distress and brings challenges that can seem overwhelming. Due to this burden, there is an ongoing need for supportive care approaches that help patients manage the practical and emotional toll of advanced cancer. As part of the study, patients filled out questionnaires when they joined the study and then again 3 and 6 months later. Researchers found that those receiving CALM were 19% more likely to show a reduction in severity of symptoms than those receiving usual care after 3 months. After 6 months, those receiving CALM were 29% more likely to show a reduction of severity of symptoms. CALM participants were also less likely to develop symptoms of depression. Over time, patients receiving CALM felt more prepared to understand their cancer experience, were better able to deal with changes in relationships, and found new ways to communicate with their health care team. What does this mean? Methods like CALM could help many cancer centers improve their psychological health services and, in turn, improve the quality of life for more people with advanced cancer. An analysis of data from 23,600 childhood cancer survivors shows that the occurrence of severe health conditions has declined over the past few decades. The rate decreased from about 13% among survivors diagnosed in the 1970s to about 10% among those diagnosed in the 1980s and nearly 9% among those diagnosed in the 1990s. Researchers took data from the Childhood Cancer Survivor Study (CCSS), which is funded by the National Institutes of Health. The analysis focused on severe, disabling, life-threatening, or fatal health problems occurring within 15 years of a diagnosis of cancer during childhood. The decreases were largest for survivors of Wilms tumor and Hodgkin lymphoma, but there were also decreases for survivors of astrocytoma, non-Hodgkin lymphoma, and acute lymphoblastic leukemia. No decrease was seen in some types of childhood cancers, such as neuroblastoma, acute myeloid leukemia, soft-tissue sarcoma, and osteosarcoma. Endocrine conditions and new cancers decreased the most. Gastrointestinal conditions and nervous system-related problems also decreased. The rates of heart problems or lung conditions did not change. What does this mean? This data suggests that advances in cancer treatment and supportive care have helped improve the long-term health of childhood cancer survivors. However, regular follow-up care remains important due to survivors’ increased risk of long-term effects overall. A study of 688 patients with metastatic cancer found that a single dose of radiation therapy is as effective as 5 doses of radiation therapy for metastatic spinal cord compression. Spinal cord compression is when cancer is in the spine and presses on the spinal cord, causing pain, numbness, and difficulty walking. It is common in people with metastatic cancer, which is cancer that has spread from the location where it began to other parts of the body. Radiation therapy and/or surgery are commonly used to relieve pain and other symptoms of spinal cord compression. Currently, there is no standard approach to giving radiation therapy for this condition. Most of the people in the study were men with metastatic prostate cancer, but there were also people with metastatic lung, breast, and gastrointestinal cancers. Researchers measured the effectiveness of the treatments by how well the patients were able to walk. After 8 weeks, about 70% of patients who received 1 dose of radiation therapy and 73% of patients who received 5 doses were able to walk normally or walk with a cane or walker. In addition, researchers found that the median overall survival of the 2 groups was similar—about 12 weeks for those who received 1 dose and about 14 weeks for those who received 5 doses. The occurrence of severe side effects were almost the same in both groups, but mild side effects were less common for those who received 1 dose of radiation therapy. What does this mean? A single dose of radiation therapy instead of several doses for spinal cord compression is an option for patients with a shorter life expectancy. More research is needed to find out if more doses of radiation therapy work better for patients who expect to live a longer time. Visit the Cancer.Net Blog every day for daily reports from Chicago during the ASCO Annual Meeting. You can also keep up with the meeting’s news by following Cancer.Net on Facebook and Twitter. Like what you’ve read here at Cancer.Net? Sign up for our monthly Inside Cancer.Net e-newsletter.